I'm going to pimp another one of my favorite blogs, "That's My Apple." READ IT IT'S REALLY GOOD. Eve wrote a great post today called "The 'War' Against Christmas." I LOL'd. I'm not an atheist, as she professes to be. I'm totally down with God; I'm just fed up with religion. But this post is chock full o' wisdom-y goodness, whether you're Christian, atheist, agnostic, skeptical, or uncommitted. At least I think so. So click on it and read it. DO THAT. DO IT NOW. This reminded me of when I was a little bitty child, and my parents had just bought their first house after years of renting. We had also gotten our first puppy shortly after moving in. The house didn't have a fireplace, so there was no mantle on which to put our Nativity scene on our first Christmas in the family home. I think maybe we set it up on the coffee table, or somewhere similarly low to the ground. And Suzy, our darling puppy, proceeded to snag the baby Jesus and gnaw His head off. That's been in my head ever since I read Eve's post. And I'm totally good with that as a Christmas soundtrack. Seriously, show "That's My Apple" some love. Eve is a talented writer AND artist. 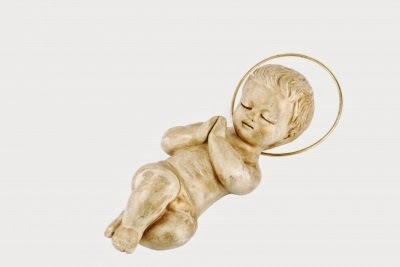 And keep watch over Baby Jesus this Yuletide. Son of God or not, He is irresistible to puppies. This just warms the cockles of my agnostic heart. It's the perfect antidote to being yelled at for wishing someone "Happy holidays." Or it would be if I hadn't already said, "Sorry, I meant 'Saturn is the reason for the season. Let me get my Phrygian cap." I had a crucified Jesus - earthen statue on polished wood. Then the statue lost both arms. It became quite exactly the Jesus de Milo.